Book	(ISBN-10: 1-890595-93-4; ISBN-13: 978-1-890595-93-7); In stock, ships same business day First Update since 2002! The Handbook of Pharmaceutical Additives, Third Edition has been extensively updated from the previous edition, which was published in 2002. It describes more than 5300 trade name products and 4000 generic chemicals and materials, available from worldwide manufacturers, that function as pharmaceutical additives. improving consumption ease of the dosage form by masking unpleasant odor, improving palatibility or appearance of the active ingredient. Thus, the definition of pharmaceutical additives for the purpose of this work encompasses excipients, synergists, or chemicals that substantively contribute to the effectiveness of the active ingredient. Entries for both trade names and chemicals contain extensive information gathered from worldwide manufacturers, distributors, trade journals, government documents, and other reference sources. 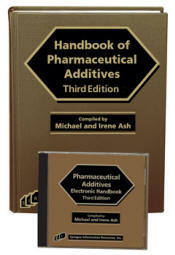 Both the Handbook of Pharmaceutical Additives, Third Edition and the software version centralize and integrate information on these chemicals and materials thereby serving as an essential guide to product managers, formulation scientists, quality controllers, ingredient chemists, pharmacists, physicians, and consumers. Trade Name Reference contains over 5300 alphabetical entries of trade name pharmaceutical additive products with extensive profiles of each product listed. Chemical Component Cross-Reference contains more than 4000 pharmaceutical chemicals/materials that are either contained in the trade name products profiled in Part I or are generic chemicals used as pharmaceutical additive ingredients. Each entry includes, wherever possible, its synonyms, CAS number, EINECS number/ELINCS, FEMA number, UN/DOT number, molecular and empirical formulas, chemical properties, functions and applications, toxicology, precautions, use levels, regulatory information, and manufacturers and distributors of the chemical. All chemical/material synonyms are cross-referenced back to the main entry. The chemical monograph entries also contain a listing of the trade name products that are either equivalent to the chemical entry or contain this chemical as one of its ingredients. Functional/Application Index is a powerful tool for locating the trade names and chemicals based on their function and application. By searching for key functional words related to pharmaceutical additives such as anticaking agents, binders, colorants, disintegrants, emulsifiers, encapsulants, fillers, flavors, gellants, in specific application areas such as tablets, capsules, inhalants, ointments, suppositories, etc., the user is directed to the trade names and/or chemicals that have that specific functional/application attribute. The generic component names are distinguished from the trade names by italic type in the book and color in the software. Detailed contact information for the more than 3000 worldwide manufacturers and their branches of trade name products and chemical components that are referenced in this handbook. Wherever possible, telephone, telefax, toll-free numbers, e-mail and internet addresses (functional in the software), and complete mailing addresses are included for each manufacturer. Glossary contains definitions of terminology associated with pharmaceutical additives and their application areas.